If it is necessary to escape from a building people must always be able to reach the open air or a safe area. 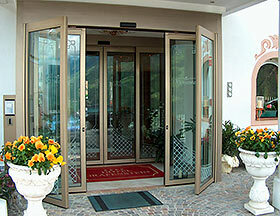 In this special situation automatic doors take over important tasks. While offering the convenience of an automatic door in normal situations, in the event of an emergency, fire doors must make an escape route available in a matter of seconds. Therefore during normal operating times the fire doors in a building may not ordinarily be locked; they must also be easy to open by means of a handle. TORMAX offers both mechanical and electrical solutions for rescue and escape routes.